Closed since March, the Wells Street Bridge is slated to reopen to cars, bikes and pedestrians today. Published Nov. 30, 2018 at 9:01 a.m. Downtown drivers, pedestrians and cyclists rejoice! 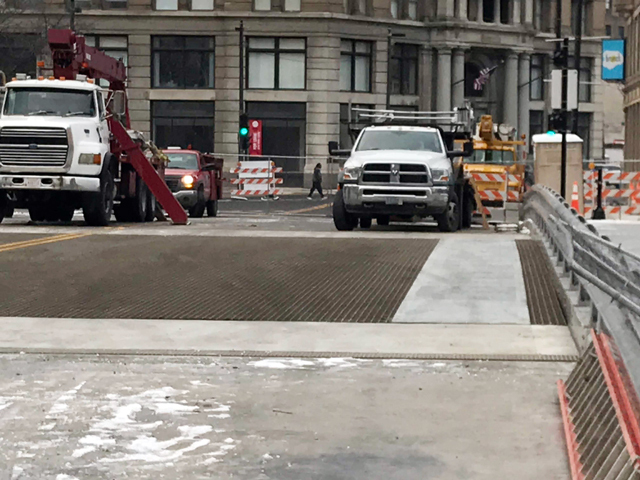 After being closed for nine months, the Wells Street Bridge is expected to open today by 5 p.m., when work is scheduled to wrap up on rehabilitation of the bridge. The vertical lift bridge over the Milwaukee River closed to traffic of all kinds on March 5 and spent much of the past few months in the open position to allow river traffic to pass below, while workers upgraded structural, hydraulic, mechanical and electrical components. The Department of Public Works also replaced gutters, curbs and sidewalk slabs as necessary. Visitors will be pleased to find full access restored to the Bronze Fonz once the Wells Street sidewalk is reopened. During construction it was only possible to reach the statue from the Riverwalk via Mason Street. 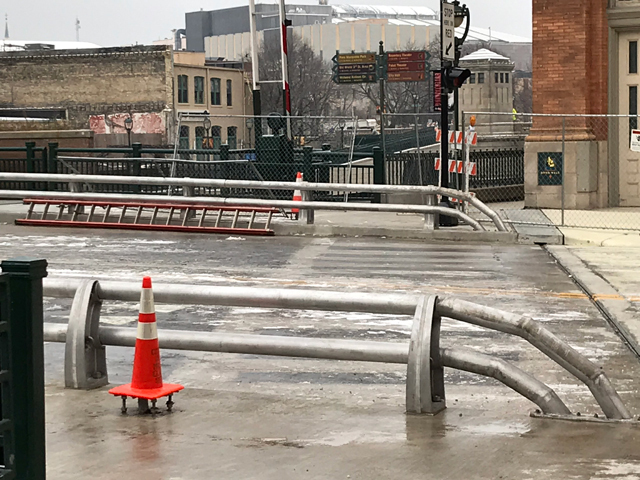 The re-opened bridge will have railings (pictured above) between the roadway and sidewalks to protect pedestrians. There will be 11-foot-wide driving lanes in each director as well as bike plates (pictured below) to smooth the ride over the grated road surface. The current bridge was constructed in 1985. At that time, the existing bridge house was sold and moved to a South Side backyard, where it still stands. You can read a story about that here. The upgrades to the bridge were funded by the Wisconsin Department of Transportation and the City of Milwaukee DPW.